While we detailed a number of new features of iOS 7 beta 2 earlier today, a MacRumors reader sent us a tip on a small change that has gone unnoticed since the first beta was released on June 10. In iOS 7, screenshot behavior has been altered, and as the release notes state, "Active touches are no longer canceled when the user takes a screenshot." This minor change has a number of implications for several apps that rely on screenshots to notify users of unwanted behavior, such as Snapchat and Facebook Poke. 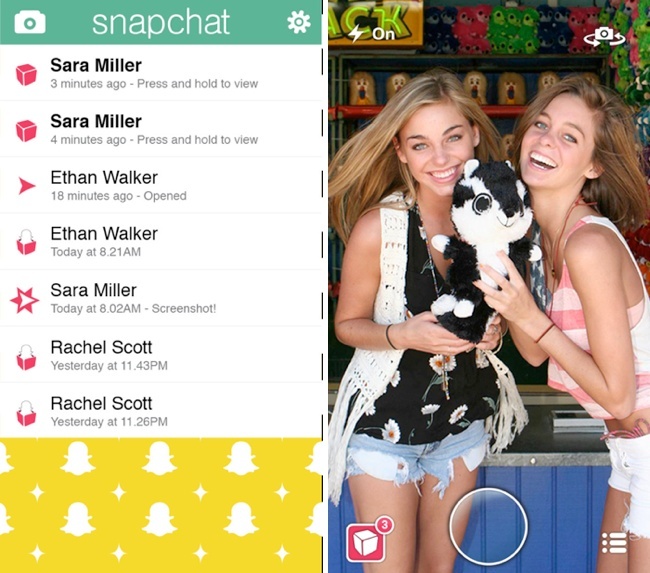 When a user opens a Snapchat photo in the app, a finger is required on the screen to hold the photo open while viewing the picture. The act of taking a screenshot interrupts the picture viewing and closes the photo, which is the method that Snapchat uses to detect an "illegal" screenshot, thereby notifying the sender of the photo that a snapshot has been saved. In iOS 7, taking a screenshot no longer closes the photo viewing window in Snapchat, which means no notification is sent when a screenshot is captured. As screenshots no longer interrupt on-screen touches, the photo stays open and the app is unable to recognize the screenshot action. iOS 7 users will be notified if an iOS 6 user takes a screenshot of a sent photo, but the reverse is not true. Snapchat's screenshot detection, which is designed to be a safety measure to keep photos private, has had issues in the past. Earlier this year, several screenshot workarounds surfaced, allowing users to save photos without sending notifications, and with iOS 7, a workaround isn't required as the app's core functionality is disabled. While the change has immediate implications for Snapchat users interacting with other users running iOS 7, it will ultimately require Snapchat and similar apps to come up with a new method for detecting screenshots or to abandon the feature entirely when the final version of iOS 7 is released. Please, Snapchat, give us a break! You can never prevent people from snapping a photo of the screen. The ultimate workaround has always been -- and will always be -- the same. Take a photo of your screen with another iPhone, an iPod, an iPad, or any normal digital camera!! Do people use snapchat for anything other than nudes? I agree. WTF does this even mean? It sounds like snapchat was taking advantage of an iOS bug and calling it a feature. Taking a screenshot in iOS 7 does not interrupt touches on screen = screen still has touches = Snapchat still shows the photo = screenshot saves the photo == rendering Snapchat a useless messenger.